At Styledent, our mission is to build strong meaningful relationships with our clients, based on communication, sincerity and transparency, and to provide them with a durable and aesthetic product that fits their needs and those of their patients. Our vision is to maintain our position as a dental lab in the fore-front of the industry's new technologies and to stand out with our innovative ideas, exceptional quality and impeccable customer service. Each member of our team has only one goal: work in synergy to satisfy our clients. Every day, our team is devoted to serve you with professionalism and punctuality. Since 1993, we have been proudly serving dental professionals high quality products and PROVIDING excellent customer service. We are determined to SERVE your practice with a variety of prosthetic options and peace of mind. we are most proud of the long-term relationships we keep building throughout the years with our clients and their patients. * If your clinic is located within 10 km distance from the lab, you could benefit from a same day repair service. This new bite splint from Styledent is 3D printed in a biocompatible, and long-term resin from our Laval facility. It is highly resistant to both wear and fractures, and polishes up nicely, in order to give the final product a high level of optical transparency. 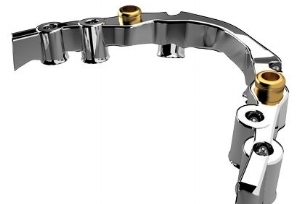 With a flexural modulus of over 1300 Mpa, it is an ideal appliance to protect existing crowns and bridges as well as preventing natural dentition attrition. We offer a vast array of implant bars. From an overdenture bar to a fixed bar with porcelain layering. Offered in zirconia, in Co-Cr or Titanium. Feel free to send us your study models for a free estimate and planning protocol. For AMERICAN CUSTOMERS, please call 1-866-586-9373. Styledent was founded in Laval, Quebec in 1993 by Stylianos Tsichlis. He had just arrived with his family from Athens, Greece when he was 53 years old and opened up his own lab, in the middle of recession, so he could feed his wife and his three children. He was a lecturer and a certified master dental lab technician, having worked in the field for more than 35 years and owned dental laboratories in Sudan, South Africa and Greece. He was an artist, a passionate one, and a man of very high standards of perfection. In 2007, his son Dimitri joined him after completing his dental technician certification in Longueuil, Québec. With a young mind set and a lot of ambition, he had a vision of what Styledent was about to become: a dental lab that could provide the most high quality hand crafted work, fabricated with the aid of the latest technologies and materials. Dimitri and his father shared a passion for sharing knowledge; Dimitri started giving lectures in universities and study groups to dentists on new dental materials from a very young age. In 2009, Dimitri’s wife Lidia also joined the family business. With a background in communications, marketing and customer service, she shared Dimitri’s vision and helped to maintain and develop relationships with dental professionals, creating tools to help dentists and prosthodontists thrive in their practice. Throughout the years, Styledent has always been on the forefront of technology, investing in the latest equipment and always being current with new studies and new materials. We are now proud to be recognized by our peers as the “high tech lab”. In 2014, we even opened up our sister company, CAMdent Milling Center, to serve other dental laboratories in Canada, offering dental milling services. Today, what we are most proud of is our team. Each and every one of our team member works everyday with the passion and the perfection that our founder M. Tsichlis taught us. We continue to follow his path, giving our best in perfecting our art and technique, now with the help of technology. We will always go forward remembering his teachings, principles and values.